As promised, today we'll savour an example of Christian approach to global warming. The book is called A Moral Climate: The Ethics of Global Warming. Once again, the title alone made me choose the book, although frankly, had I noticed in time that it's an example of Christian literature, I would probably let it pass. I value ethics but I also have limited patience for sermons. The Christian (or at least this particular Christian's) remedy to the changing climate is really very simple: repent, repent, repent. Only the Lord can save the Earth. Yeah, that easy. Perhaps I'm being unnecessarily cruel, but if not for all the religious exhortations the book would be really interesting. Northcott's social criticism is mostly spot-on (if a little too enthusiastic or simplistic at times). It is not limited to climate either. Consumerism gets its share of fire and brimstone (always a good move in my book), so do inequality, greed and exploitative politics of the West. Yes, our 'civilised' world is not really too impressive from the ethical point of view. The developed nations' treatment of, well, pretty much everyone else is outrageous. Jungle law rules. Money is the highest good and if a few billions of less fortunate people fall through the cracks, well, that's the price of progress. Nah, you don't need to be religious to spot that things are not exactly ok. 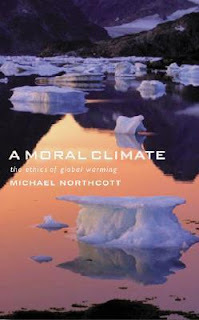 I'd appreciate Northcott suggesting any practical solutions to the ethical problem we're facing but few are forthcoming. Hoping that the whole world will suddenly see the light, invite Christ and return to the times of pastoral bliss is not very realistic. The assumption that 'Christian' equals 'moral' is highly suspicious, too. After all, the country with the highest number of Christ followers also happens to be the worst polluter. Funny how this coincidence escaped Northcott's scrutiny. Not to mention crusades, burning of the witches, religious wars, abusive clergy and other ecclesiastical specialities. I know I'm being nasty again, but the claim that only Christians can behave ethically makes my blood boil. Atheist does not equal immoral, no matter what theologians say. Northcott does not really attack any other religions, he just conveniently ignores them. Hm? If it's a GLOBAL warming, perhaps we should try to find a global solution to the problem? Or is it forced conversions and religious wars again? When it comes to readability, A Moral Climate is a bit of a drag, especially when Northcott starts analysing the Bible (proving decisively that with enough verbal gymnastics you can use the Good Book to justify absolutely everything). I can stomach only so much preaching at a time, so quite a few days have passed before I got through it. Despite its numerous faults, A Moral Climate was still much less odious than Lawson 'reasoning'. Naive, preachy and unrealistic it may be, but at least it's not dismissive of everyone who actually wants to do something to stop the Earth from turning into a noxious desert. Fair enough.